Sea Fortress Suomenlinna and Uspenskin Cathedral (Uspenskin Katedraali) are good opportunities to explore the local culture. 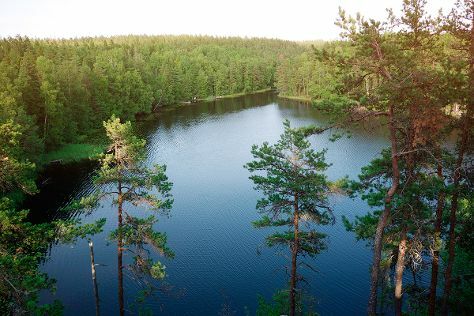 Escape the urban bustle at Nuuksio National Park and Sipoonkorven Kansallispuisto. When in Helsinki, make a side trip to see Arctic Expedition in Espoo, approximately 42 minutes away. And it doesn't end there: contemplate in the serene atmosphere at Rock Church, go for a walk through Uutelan luontopolku, take in the architecture and atmosphere at Helsinki Cathedral, and find your balance on the water with some of the best stand-up paddleboarding in the area. To see reviews, traveler tips, and more tourist information, use the Helsinki vacation app . Moscow, Russia to Helsinki is an approximately 5.5-hour flight. You can also take a train; or drive. The time zone difference moving from Moscow Standard Time (MSK) to Eastern European Time (EET) is minus 1 hour. In April, plan for daily highs up to 9°C, and evening lows to 0°C. Wrap up your sightseeing on the 20th (Sat) early enough to travel back home.